At E3 2018 Logitech showed off their latest PC peripheral innovation in the form of the Logitech G512 Carbon Mechanical Keyboard. The G512 is a gaming keyboard by Logitech G that comes in three different key switch options: Romer-G Tactile, Romer-G Linear, and GX Blue. 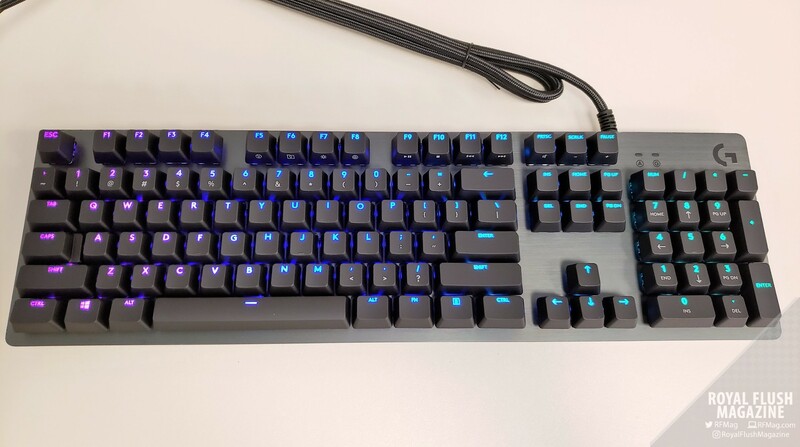 The keyboard comes complete with RGB lighting that is customizable per key, onboard memory for storing those lighting configurations, and function keys which can be programmed with custom functions and macros. Of course, it does not stop there. Instead of an E3 preview, we’re giving you a full on review! Let’s dive into the Logitech G512 Carbon Mechanical Keyboard, GX Blue switch version. From the moment you take it out of the box, you’ll notice that the Logitech G512 features a sleek aluminum body. What you are feeling and seeing is an aircraft-grade 5052 aluminum-magnesium alloy for keyboard’s chassis. This is definitely a solid and hefty build, coupled with six rubber feet, keeping the G512 stationary at all times. The keyboard as a whole keeps things tight with a minimalistic build devoid of standalone media keys. Media keys and various other feature keys are aligned within the function keys, being accessible when pressing the FN key. The keys themselves are individually customizable in their LED illumination, with each individual key capable of displaying 16.8 million different colors. Each key utilizes a sort of raised-cap arrangement that works nicely to display LED light around the sides of the G512. The body of the Logitech G512 also features a USB 2.0 pass-through port, perfect for forwarding a port from the back of your tower to the top of your desk. While we’re on cables, the 6-foot cable is threaded, which is always welcomed with wired PC peripherals, given their resistance to wire-snagging. As for the feel, the version of the Logitech G512 Carbon keyboard we are viewing houses GX Blue mechanical switches. This new option is a change-up from the Romer-G switches seen in the vast majority of the gaming keyboards that Logitech G sent out into the wild. The GX Blue switch has you pressing in a couple of tenths of a millimeter deeper than you would with the Romer-G switches. While the Romer-G switches have an actuation distance of 1.5 mm and a total travel distance of 3.2 mm, the GX Blue’s are at 1.9 mm of actuation distance and 4.0 mm of total travel distance. When I’m frantically clicking about, I care more about the over tactile feel and responsiveness of the keys than their travel distances, which leads to how the GX Blue’s felt. The GX Blue switches are very light and clicky. It’s a very enjoyable key press sensation where you “hear the actuation” just like the box advertises. The switches are loud but very responsive and satisfying. You hear and feel the click, seeing instantaneous results on screen. 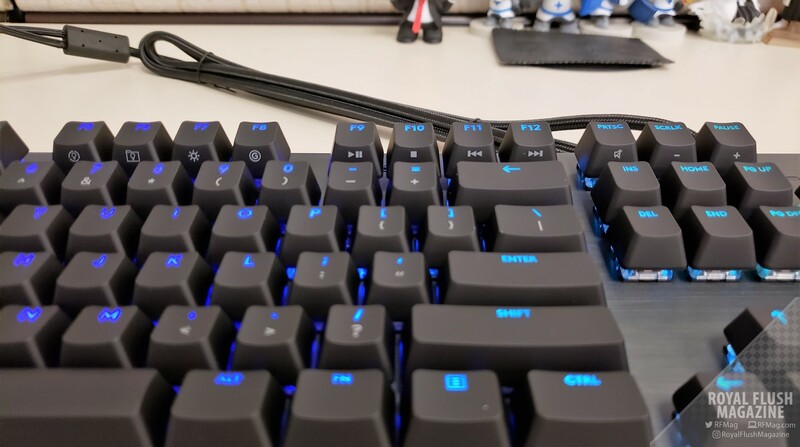 In comparison with Romer-G switches, I found the GX Blue’s to feel lighter and softer, with a smidgen more bounce to them. Keyboard switches are a matter of preference. I prefer a heavier key press myself, being as heavy handed as I am. So I was pleasantly surprised at how satisfied I was using the much lighter and snappier GX Blue’s. I felt as comfortable playing Warframe as I did using the keyboard for simply typing. Saddle that experience with the sleek brushed metal chassis and RBG lighting, and the Logitech G512 Carbon keyboard is a solid build all-around. In the Build, Look, and Feel department, the G512 was quite the welcomed surprise for keyboard that only goes for $99. The Logitech Gaming Software (LGS), as the name suggests, is Logitech G’s very own customization suite for the bulk of their PC gaming peripherals. The LGS gives you exactly what you expect in a peripheral customization software of today’s day and age. You can create profiles that control lighting and key behaviors which automatically boot up when the applicable game is running. If the game supports it, you can even allow certain games to give the user game-related feedback through the G512’s LED’s. You also have a straight-forward macro creator that can record your keystrokes and allow you to double-back to make tweaks in timing. The LGS added to the experience with the G512 while taking nothing away. Occasionally I did have some hiccups with the auto-loading of profiles, which was easily resolved by Alt-Tab’ing out and back into the game. Once I got a hang of how to create and manipulate light zones, creating various lighting profiles was easy. The LGS’s automatic game detector worked well enough and found a good 70% of my games, making it easy to just choose the game and start editing away, as opposed to the obligatory directory browsing for exe files. For $99, the Logitech G512 Carbon Mechanical Keyboard is a steal that gets the job done. Its brushed aluminum chassis promotes confidence in the overall build quality of the G512, while adding a nice bit of style at the same time. Despite being a full QWERTY keyboard complete with numpad, the G512 has a compact footprint, not taking up more space on your desk than it has to. The GX Blue switches are a dream to both play and type on, making it an attractive purchase option for the G512. If you’re in the market for a new keyboard that is both slick in appearance and performance, but doesn’t break the bank, do check out the Logitech G512 Carbon Mechanical Keyboard for yourself here. 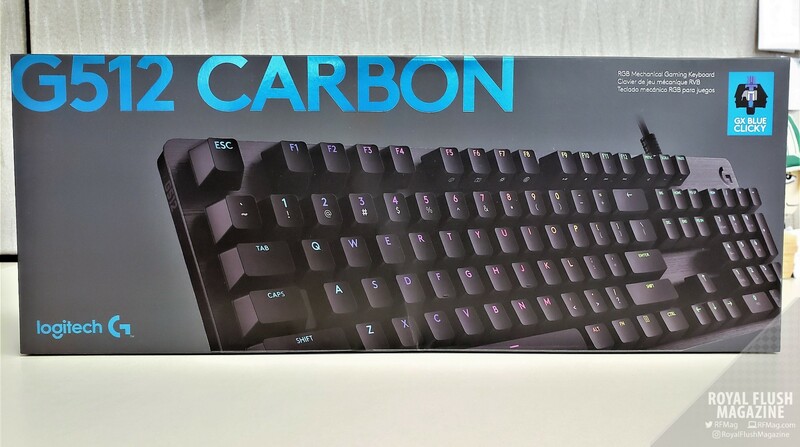 † The Logitech G512 Carbon Mechanical Keyboard and non-watermarked screenshots provided by Logitech PR for review.